In a deal that would be a win-win for everyone, Roku could be pairing up with Sonos to add Roku TV voice controls to a Sonos voice-enabled speaker. The partnership, which is still in the works, would be a boon for home entertainment enthusiasts who often use a Roku TV or player alongside a Sonos system like the Sonos One speaker or Sonos Beam. More importantly, the deal might let you wirelessly connect your Sonos speakers to a Roku TV thanks to the Roku Connect platform - which so far only includes the Roku Wireless Speakers. This collaboration would make sense as it adds a big brand name to the Roku Connect platform while simultaneously pushing Roku fans towards buying a Sonos-made speaker. As great as this sounds, this is all still just a rumor at this point according to CNET, with no confirmation from either company. But, should a deal come to fruition, it could also mean that Sonos would support the Roku Entertainment Assistant, the company's new voice assistant that’s likely to debut next year. If that becomes available on the Sonos One, Roku Entertainment Assistant would fourth supported smart assistant to appear on the platform after Alexa, Google Assistant and Apple’s Siri that’s supported via AirPlay 2. Hey Roku, find me some movies, will ya? 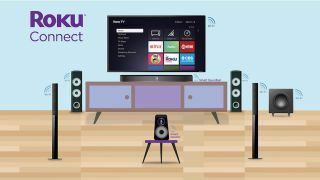 In practice, the integration of the Roku Entertainment Assistant would let users search for movies and shows in Roku’s vast library of content using voice commands. Then, when they come across the content they’d like to play, it can just be sent to the Roku TV or Roku player, similar in the way Chromecast and Google Assistant speakers work today. A plan like this does raise some concerns about how robust Roku’s smart assistant is going to be and if Sonos will compromise its relationship with other mainstream players when it adds Roku Entertainment Assistant integration, but we’re sure these types of details will all be ironed out behind closed doors in the next few months. Until then, we can look forward to the first Roku Connect product, the Roku Wireless Speakers, that are due out in November of this year.